Cover Fire is a cool shooting game. Here you will confront a powerful organization Tetracorp, which seeks power and total control. Here, high-quality graphic design, stunning animation effects. In addition, the developers added great sound effects that cause exceptionally pleasant impressions. You need to quickly make a clear plan that will repel all enemies attacking your territory. Take the most unique weapon from your arsenal, teach your soldiers new skills and fight back anyone who gets in the way. Try to destroy as many zombies as possible, they will appear from all sides, be careful and attentive. New shooter experience. It’s necessary to join the defense as soon as possible, to become a real commander of the revolution against Tetracorp. You need to use all the reserves, even grenades, to repel enemies from all sides. There is a trigger function. It will allow controlling everyone on the map with one finger. You will see the unique graphics in the game, which is not in the other games! You will need to create your own, unique strategy to win enemies. It is necessary to collect as many different tools as possible, grenades, and other means of protection. In the game there are still many different functions, for example, you need to create your own squad with skills. Feel yourself a real commander! The virtual commander must competently lead the wards. Perform the tasks and get great pleasure from the gameplay. This is one of the coolest and realistic games in the genre of action, which you can play offline. Just try to download Blazing Sniper and start a global shootout with enemies. The player will be able to feel like a real sniper and shoot a huge army of enemies. Thanks to the innovative graphics, it will be possible to play action from any mobile device and complete hundreds of tasks. Use a huge amount of weapons in a shootout, among which there are machine guns, uniforms, and rifles. 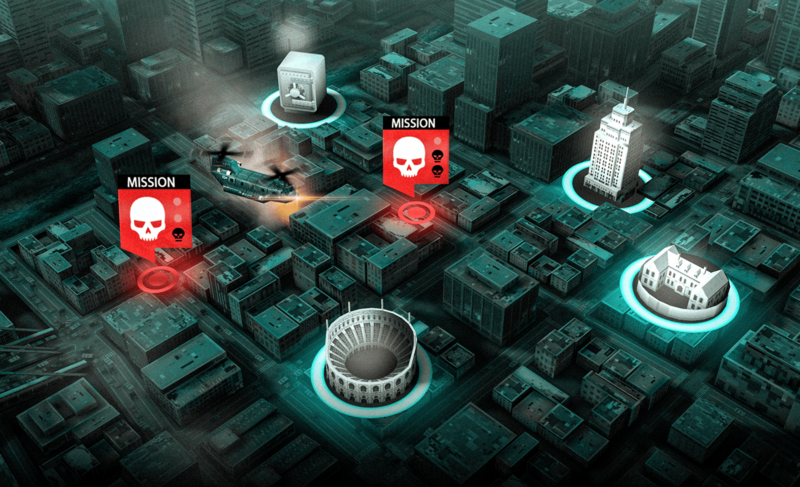 Perform a huge number of tasks that offer to fight terrorists. Join the most professional soldiers from the squad of elite special forces and travel to different islands. You will be asked to perform a huge number of missions that are secret. 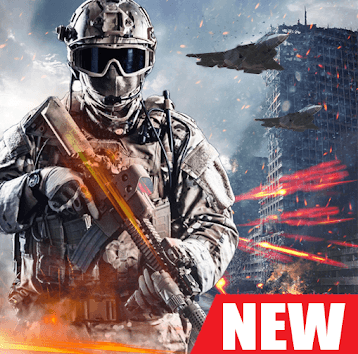 Eliminate any threat that comes from enemies, get access to new uniforms, weapons and, of course, missions. In each location, where the player will appear, you will need to use your skills and abilities to shoot the enemies. Become a commander and try to reverse the outcome of this fantastic confrontation. Each of the missions will take quite a lot of time. Learn to move secretly, then to deliver a crushing blow to opponents. The player can even use military equipment and vehicles to achieve success. In addition, the player will be able to take advantage of the largest arsenal of weapons and travel to fifty different locations. A huge number of unrealistic opportunities will be available to those who will become a soldier of a special forces unit. The player can download Gun War and try his hand at shooting as an elite fighter. During the passage of the company, you will take part in 124 missions, each of which is dangerous and difficult. Choose one of two modes in which you have to show all your abilities and skills. Gangsters, terrorists and even machines will come out against you. Moreover, think in advance if you can resist Zombies, which are practically immortal. The game has high-quality and detailed graphics in 3D. All game progress will be saved to the cloud, so never lost. Many different missions and weapons will be available to the unit fighter. The special effects of shooting and explosions look very colorful. All this immerses in a realistic atmosphere of combat time. Therefore, you should download Gun War and feel the adrenaline flowing through your veins. At the end of each stage, you will meet with the bosses. Surely, you will have to show all your skills in fights with them. The player can independently determine which of the modes of the camera is more convenient to play. It can be a first-person or third-person view. Don’t be afraid of any opponents. Release all hostages to become a hero. During the passage of special operations, the player will be able to use any weapon. Each weapon has its own mission. Reach the limit of possibilities and withstand the onslaught of a large army of opponents. This is the only way heroes appear. DEAD TARGET is an exciting action game. The action takes place in 2040 when the third world war began. However, it’s significantly different from previous wars. The Minister of Defense decided to sign a contract with a secret organization called CS so that it could conduct illegal experiments and was able to turn the prisoners into super killers. But everything didn’t go according to plan. One of the scientists of the corporation betrayed it, after which an outbreak of an unfinished virus spread throughout the country and turned most people into the living dead. Now the most difficult period for all the surviving groups of people has begun. The opposing country, having learned of such an incident, decided to send its intelligence officers to clarify information, as well as to develop a winning strategy and make a counterattack. It’s strictly forbidden to make mistakes, otherwise, your team will turn into the same dead. This game has such distinctive features as great 3D graphics, which makes the game more realistic and conveys the whole atmosphere of what is happening on the screen of a mobile device. Also, in the game, there is very realistic music and great sound effects that help you immerse yourself in the process of passing the game. In the game DEAD TARGET, you have a great opportunity to kill all the zombies that you have on your way and get extra features and experience for it. 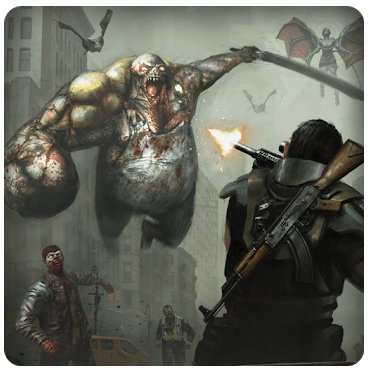 Last Hope Sniper – Zombie War – a great Android shooting game, in which the user will navigate the streets of the city in the company of survivors and kill the zombies. This free application will test your skills, such as dexterity, shooting accuracy and reaction. Each location is unique, consists of many obstacles where the walking dead can be. Choose a comfortable position for shooting and act to enable people to survive. Use a variety of weapons to destroy any enemy. Gradually the monsters will become stronger and in some locations, the gamer will face bosses. They are much stronger than ordinary inhabitants and require a special approach for destruction. 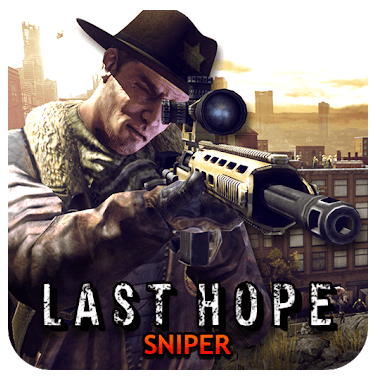 Last Hope Sniper – Zombie War has good dynamics and many levels that will test your characteristics as a fighter. Competent movement through the streets of the city, good communication with the members of the squad will allow you to achieve excellent results and save the surviving inhabitants. Locations are well developed and include interactive items that respond to different user actions. 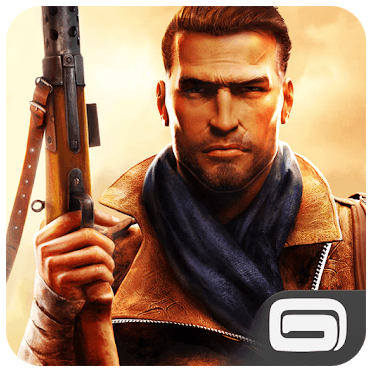 Last Hope Sniper – Zombie War is a great Android first-person shooter where the user will be able to defend the base from the attack of zombies. An unknown virus broke free and attacked all living things in its path. As a result of mass infection, people turned into the walking dead, and the future of mankind is under threat. You are the only one whom the evil could not reach, and now in the game DEAD TRIGGER, you have to find the root of the virus, exterminating the many thousands army of bloodthirsty zombies. 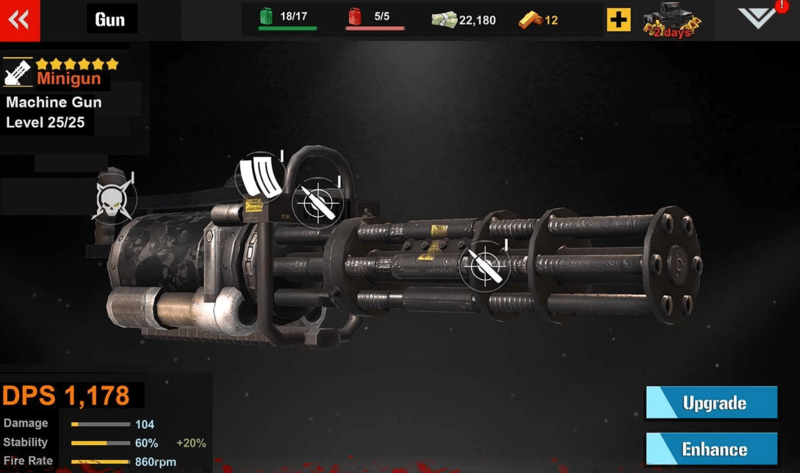 The game DEAD TRIGGER for Android starts from the choice of mission, battlefield, and weapon depending on the available means. In particular, there are 2 types of money in the game: cash and gold. A player gets cash for performing missions and tasks, collecting cash boxes during the battle and the dismemberment of zombies. Gold is earned with each transition to a new level and for the performance of the bonus mission, available once a day. Cash and gold can be spent on the purchase of weapons, equipment, and character improvement. Basically, the weapons used in the DEAD TRIGGER are based on real firearms such as the Colt 1911 and AK-47. In addition, the game has a wide selection of machine guns, shotguns, rifles, and melee weapons. When you get a new level, new weapons and other items are opened. The game has many additional features, a large 3D image of the characters, plus a high 3D sound quality. N.O.V.A. Legacy – a futuristic first-person shooter developed by Gameloft. The user will be in the role of Kal Wardin, who, dressed in a stylish armored suit, will resist the alien invaders. AI assistant Yelena will help the protagonist in this difficult task, whose tips and advice are never superfluous. The scene of action is a huge space ship, which has been attacked by aliens. The main occupation will be the destruction of robotic enemies, as well as assistance to allies. During the campaign, the user will be able to improve the weapon and armor of the protagonist, as well as use a number of other upgrades. The game can boast a nice three-dimensional graphics and high-quality sound. In addition, the optimization is performed at a high level. N.O.V.A. 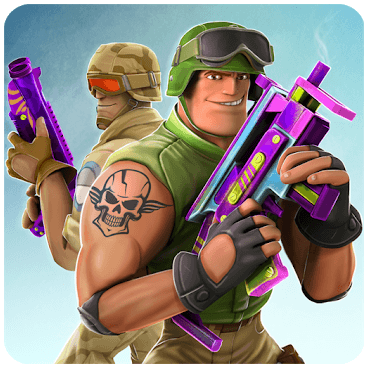 Legacy – a classic mobile shooter, made in the best traditions of Gameloft. You have the unique opportunity to plunge into such a gaming world on your mobile device, which is not inferior to the console gaming world. Guns of Boom is one of the few mobile shooters that is really comfortable to play on your smartphone. Grab a weapon and break into one of the colorful maps of Guns of Boom. 48 guns for every taste: machine guns, shotguns, machine guns, and rifles. With the help of earned gaming experience, you can discover new items. Get new skins for characters to customize your avatar and more. As soon as you arrive at the location, bullets will fly past you and you will need to quickly hide into the shelter and start shooting back. Only your ingenuity and cunning will help in this war. The arcade madness in the funny action movie Ramboat is based on the famous Rambo movie series. The main character Membo with a red ribbon on his head is armed to the teeth. Membo alone deals with the army of the enemy. The rules are as follows – wreak havoc, bring destruction and survive in the wild conditions! Initially, the arcade game Ramboat shares all the secrets: introduces the rules and tricks, recommends weapons, awards coins and first bonuses. However, after a few minutes, wild chaos enters into force. Fight hundreds of opponents, dodge and strike back. Use animals as transport. Clouds of bullets and many enemies will meet you, so don’t hope that your adventure will be easy. Rocket launchers and submarines will come out against you, along with armies of soldiers. Unlock and upgrade weapons to become even more powerful. Be ready to use all your experience in order to achieve the desired results. 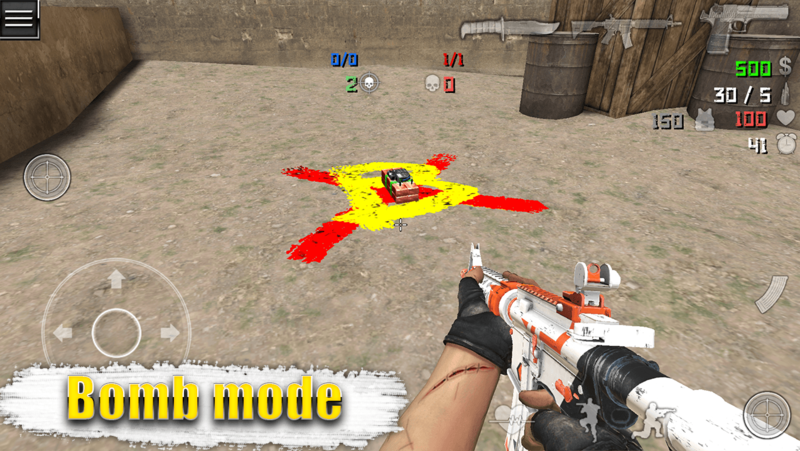 The game is a dynamic and hurricane first-person shooter for mobile devices. There is a single game mode, which is not as cool as the multiplayer mode, but you can play if you don’t have the Internet at the moment. In Respawnables, there is a test system. During its passage, you will be given additional bonuses. The game has a system of equipment, which includes weapons, body armor, skins, as well as various accessories in the form of grenades, glasses or clothing. In single-player mode, you will have to wait for more than 180 tasks of varying difficulty that will not be so easy to complete, but interesting. In multiplayer, up to 16 players are supported, and there is also the opportunity to play with friends against opponents. There are many weapons here, and they are all different. For example, there are pistols and machine guns, as well as rocket launchers and crossbows. Nice graphics and intuitive interface. Zombie Age 2 is an excellent platformer with elements of a shooter that allows the player to fight the hordes of the dead right on the streets of the city. Arcade control is subject to everyone, so learning to play this game will be easy. A small group of survivors took a long time to hide in their own house during the apocalypse on the streets. The living dead often stormed a human refuge, but unsuccessfully, weapons and properly placed barriers did their work. From early morning until late evening, the war of the living with the dead continued, but no result followed – the zombies came again, and people continued to suffer without food and a chance to survive. Finally, the guys got out of the house and went to meet the adventure and fight for survival! In each mission, players will have to fight the dead, using different weapons and achieve the goal. In Zombie Age 2, you basically have to kill a certain number of opponents or pass a specified distance in time. A large number of levels provide an opportunity for the player to enjoy a bloody shooter, and each kill and passing level gives him a certain fee for passing. The resulting money can be spent on improving or buying a new weapon. In the game Special Forces Group 2, the special forces and the terrorists will come together again in opposition, and you will need to choose your side and join the team. Decide who is closer to you, with whom you want to engage in a fierce battle. You will have the opportunity to move freely throughout the area indicated on the map, as well as you will get complete freedom of movement. Any enemies appearing on the way should be killed. Also, the game will provide you with various missions and tasks, so you will not only fight with the enemy. All battles take place in a variety of locations, such as the desert, various cities, and just abandoned objects. Try to navigate the terrain to find an excellent position, to deliver a decisive blow to the enemies when they don’t expect it. You can also find shelters in which there will be an opportunity to catch your breath or arrange an ambush. Teamwork is still very important in the game. So, communicate with your allies, develop plans for unexpected attacks. The choice of weapons will delight any gamer. There are practically no restrictions in this regard. Also, the game has a large selection of different terrain and very convenient operation. And of course, you will be offered several game modes. LONEWOLF is a two-dimensional shooting gallery with a memorable storyline, the atmosphere of neo-noir and the harsh realism of passing missions. The action takes place in a large metropolis, where criminal deals are done and real wars are fought. The plot tells about the organization “Assembly”, performing various tasks to eliminate various people. Players should shoot, collect money, kill and raise the status. The main shootout in LONEWOLF takes place at enormous distances. For accurate shooting, you will have to use sniper rifles with various sights, stabilizers, and additional gadgets. The game is not as simple as it may seem at first. You will have to learn the story of the character in parts. The atmosphere of the game is incredible, thanks to its interesting genre. Free a couple of hours of time to enjoy the exciting adventures of the best sniper of all time. The game won’t allow you to break away from the screen for at least a couple of hours. You are in the world of the future. In a place where is no joy and happiness, because the planet is under the yoke of some group that is going to subjugate the whole world. Many people are simply intimidated and don’t dare to express their protest. The resistance forces are insignificantly small and don’t pose any threat to the general system. And only you can come and provide direct assistance to those who are waiting for this. The game Overkill 3 is a continuation of the already beloved first two parts of the shooter. It has good graphics and easy control. 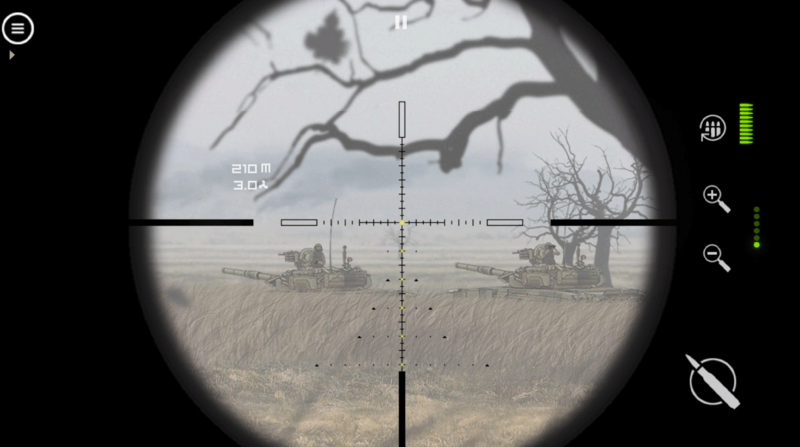 To the choice of the player, there is a whole arsenal of various powerful weapons: rifles, bazookas, attack aircraft, machine guns, and a variety of scenarios and levels with a constantly changing landscape. Overkill 3 can be played offline. The project is replete with bright elements – for example, players are strongly recommended to play with headphones for an additional sound advantage. 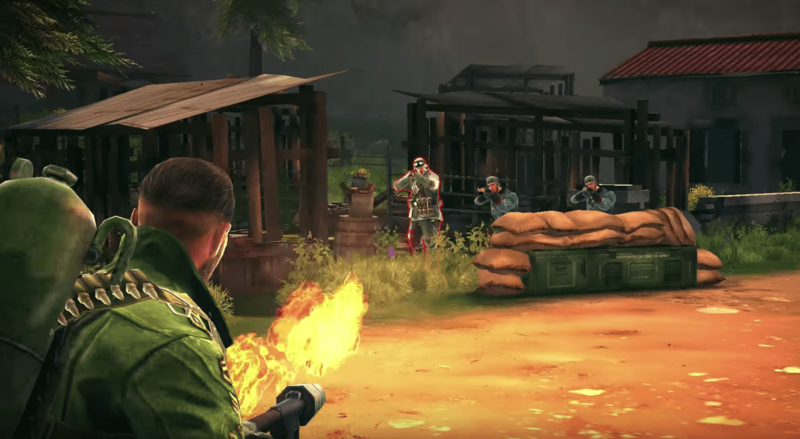 Welcome to the battlefields in the exciting third-person action shooter Brothers in Arms 3! The game will transfer you to the era of the Second World War. 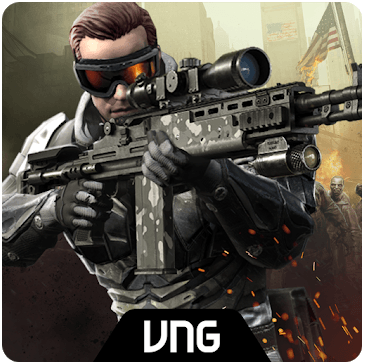 You will participate in the shootings and destroy the enemy with powerful weapons. So, you are Sergeant Wright, and soon something special will happen in your life. It all started with the fact that the Allied forces landed in Normandy… Now you lead your army into battle. Involve their skills, so as to turn the tide of battle in your favor – let the tactical advantage be on your side. The key to a successful battle is the timely upgrading of the skills of the fighters so that in the end the enemy will be defeated! Conquer allies for yourself, may they also continually improve their abilities for great accomplishments. 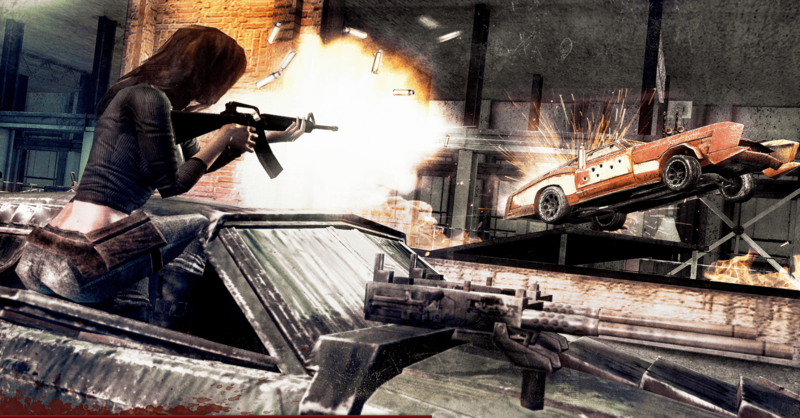 The game provides a lot of different tasks – from siege and sniper to spyware and assault. Choose your weapon from an impressive arsenal, at the same time improving their characteristics to enhance the striking effect. There will be plenty of action, real chaos will reign in the battlefield … by your efforts! 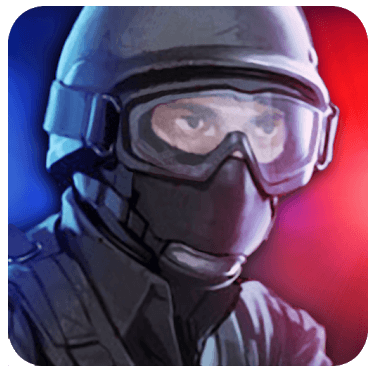 At the moment, the game Elite Killer: SWAT is the best military shooter. 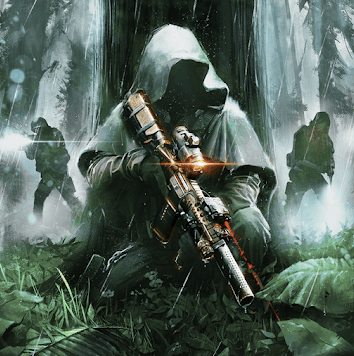 In the story of the game, you are a versatile soldier with excellent training, who alone is forced to confront the terrorist organization Syndicate all over the world. Your combat mission is to penetrate the rear of the enemy and destroy the terrorist base. To do this, you need to gradually move through the game, finding clues that will help you get to the head of the organization. Only in this way can you destroy the terrorist organization with one powerful blow and become a real hero. A simple and intuitive interface makes this game truly universal. It will suit both experienced shooter players and novice gamers who don’t yet know all the details. An additional advantage of Elite Killer: SWAT is a super realistic 3D image of characters and details. In addition, during the game, you will be able to go through more than one hundred challenging levels, which open gradually and master more than 16 maps around the world. Extra bonus: in the game, you will be able to use more than 30 types of the most modern weapons, as well as compete with other players around the world in online mode. 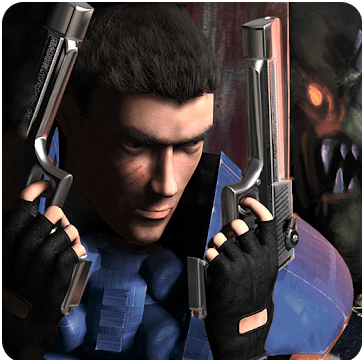 You must download Major Mayhem 2 to continue the exciting adventures in this original shooter. There will be an incredible number of missions and tasks that will need to be performed in special operations. Use all the superpowers of your character and his skills to learn how to complete exciting quests. Try to use all your abilities and skills, which will help you to get to the goal and complete the task. You must feel all the originality and beauty of this gameplay. Enjoy the lively and beautiful atmosphere of this world and achieve chic results. When you become a general of your own army, you can collect a huge amount of guns in your arsenal to destroy an army of hundreds of villains and get a reward for your victory in this war. You will be able to pass more than fifty levels in an exciting game mode, and at each new stage, even more exciting and powerful enemies will be waiting for you. Demonstrate all your skills to win the epic boss battle. 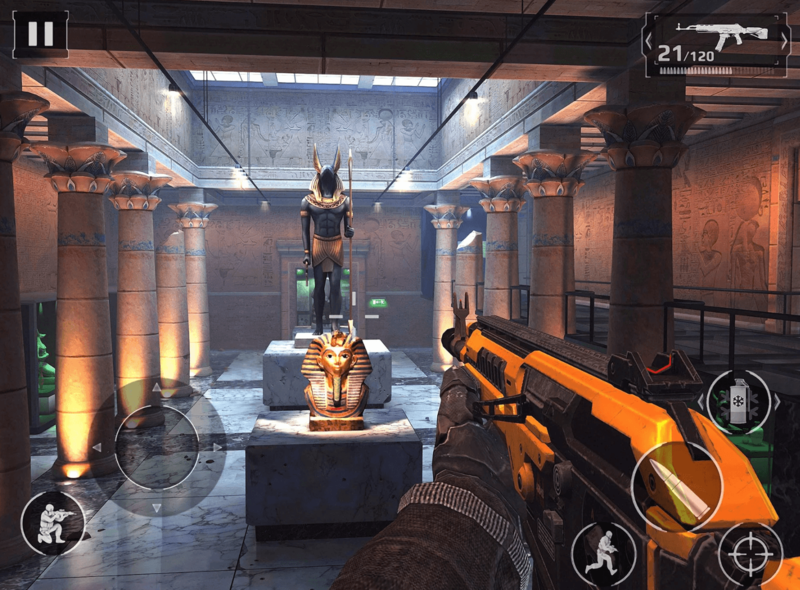 This project is a first-person shooter that is released for Android smartphones. The gameplay is divided into several levels and the player will need to perform one task. You are to kill all rivals that are on the map. It may seem that the game is difficult and there are too many enemies. But everything is much easier than it seems. The enemies don’t move even when they notice you. So, they can be easily killed with a knife. Also, the enemies absolutely don’t interact with the environment. Even if you kill one enemy in front of another, he will not react. Several grenades, machine guns, rifles, a knife, and other weapons will be available. On each level, you need to use certain weapons to perform the task. First aid kits and ammunition are scattered on the map. This is a perfect game to kill time. But you probably can not play it for a long time, because at a certain point all tasks will become routine. The enemies here don’t speak any phrases, there is no music in the background, and the maps are monotonous. But this is still a good project among shooters on smartphones. 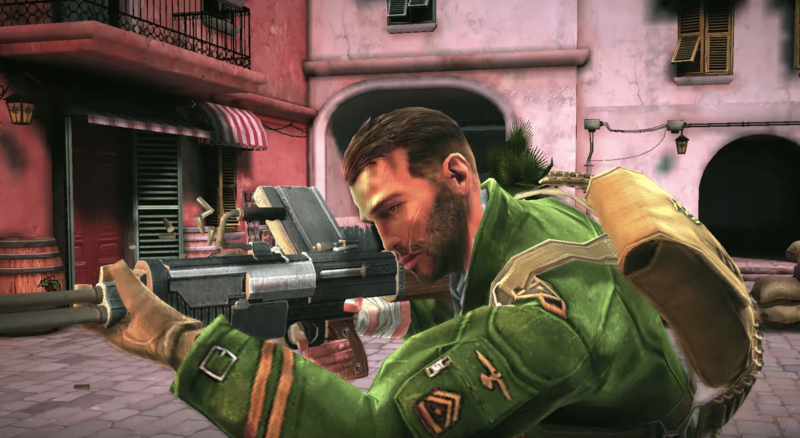 The next military shooter available for free is Modern Combat 5. Start creating a detachment, train fighters, choose weapons, invite friends to the team – and go to battle! If you prefer to play alone, you’re welcome! Become the savior of humanity, protect people from invaders and radicals who encroach on the most sacred – life and freedom. Free your city, and destroy all those who interfere with a peaceful life! You have not yet decided who you will be? You have the opportunity to become an attack aircraft, scout, paratrooper, sniper or support fighter. Teach your hero, develop skills, upgrade, choose tactics, fight alone or join a network battle with your squad against the opposing team. Detailing is amazing, and shooting sounds like real. There is a great variety of places of action – Venice, the Japanese skyscrapers, and urban battles in the ghetto, and much more. Some fighter updates can only be used in multiplayer mode. One of the undeniable advantages of Modern Combat 5 compared to other multiplayer games is that just a lot of people play it. In Modern Combat 5, you can find a game in a matter of seconds, without waiting for players to be found. 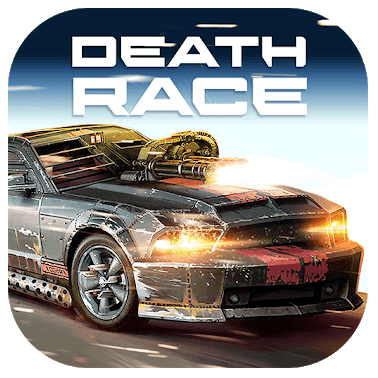 This game is your opportunity to participate in the most deadly races that you can think of. To win, you need to go through many difficulties and dangers. You will get many types of cars and weapons that need to be upgraded. This will increase the chances of winning and minimize inconvenience during the race. 3D graphics, which captivates with its realistic and cool design. It will help to feel more deeply everything that happens on the screen of the smartphone, you will believe that you really ride in races. Many different weapons: it can be just a machine gun or a rocket launcher. You immediately get a lot of cool cars that need to be improved. Play and defeat opponents, go through missions, avoid explosions and shootouts to achieve the goal. You can become a real killer machine for your rivals. 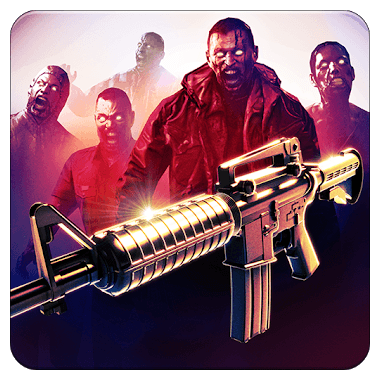 Download MAD ZOMBIES for Android and find yourself in the midst of a zombie apocalypse. Some people continue to fight monsters, but they are becoming smarter and more dangerous. The future of humanity depends on you – the surviving sniper. The main goal of the game is to destroy as many zombies of various types as possible. However, these monsters are not as stupid as they may seem. They learn, improve their skills and are able to even team up. It’s necessary to learn how to shoot zombies right in the head – the only way to destroy them. The game has a huge number of zombies. All monsters have unique skills. They are of different ages and all are aggressive. However, they are united by one thing – the desire to destroy humanity. Show your zombie shooting skills, as well as knowledge of tactics and combat strategy, improve your equipment, complete many tasks. Perhaps it’s you who will become the hero of mankind, defeating the invasion of zombies. A special forces detachment was stuck in an abandoned city, where, according to a government source, the cargo with nuclear weapons will be delivered soon. Long hours of waiting and suddenly the first shot – really an ambush? An abrupt change of location, call for reinforcements and return fire – which team will survive? Users who decide to download Counter Attack will decide! The main part of the levels in the Counter Attack project skillfully and almost imperceptibly migrated from the computer counterpart – the Counter-Strike series: even the textures are the same! The key confrontation is also guessable – a detachment of terrorists is trying to deal with special forces and vice versa, everything depends on the goal. 2072, on earth, there is a zombie epidemic… Survivors must hide in underground shelters. But there is a special group called MPS-16. It helps all the survivors. But the group receives information about scientists who were able to develop a vaccine that can destroy the virus. They are sent to the Middle East but are ambushed by the living dead. After the battle in the museum of history, the detachment discovered something unimaginable. It was that moment from which their last journey began. In order to learn about all the secrets that hid that find, you need to download DEAD WARFARE. A huge amount of weapons for every taste. Form your own squad to perform a new operation. Improve the skills of your characters and improve weapons. Fight zombies of different sizes and shapes. Rescue other survivors and look for items necessary for survival. All weapons can be viewed in 3D mode. If you want to fight for humanity, you need to download DEAD WARFARE on Android. Alien Shooter is a very interesting and exciting action where you will have to fight against a large number of monsters. You have to go through a large number of different levels, where a large number of aliens will wait for you. At each level, you will expect a completely new type of weapons, which will greatly damage these monsters. It will be completely convenient to manage it at the expense of well-implemented control. The advantage of this game is a good story, which doesn’t claim to be an Oscar but is interesting in its own way. Also don’t forget about the modern graphics, which is not so good, but boasts good optimization. 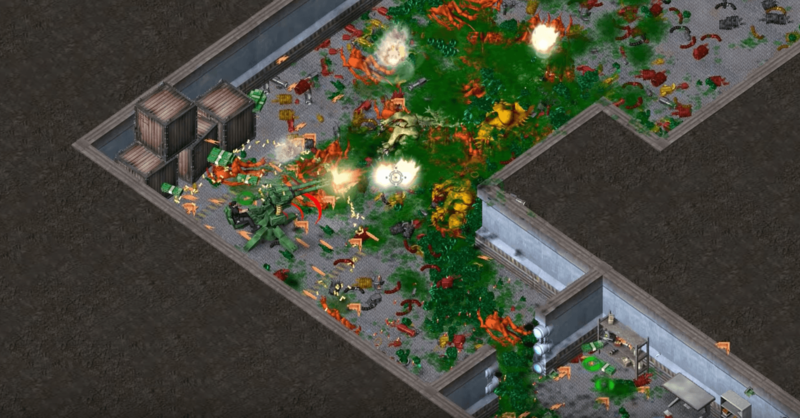 CyberSphere is a futuristic shooter with a dynamic non-stop gameplay in which gamers will have to stand against numerous enemy units while protecting the base. This is the story about the world, where a war has already been going on for a huge amount of time, which has done tremendous damage to all of humanity and users will need to do everything possible to end it quickly. But it will be quite difficult to do and it will take a lot of effort because there will be a lot of enemies on your way. And you need to choose one of the characters available to you and go straight to the front, where you need to destroy all enemy robots. The game has a lot of weapons, a large selection of robots and helper drones. There will be many enemies, bosses and endless firefights. 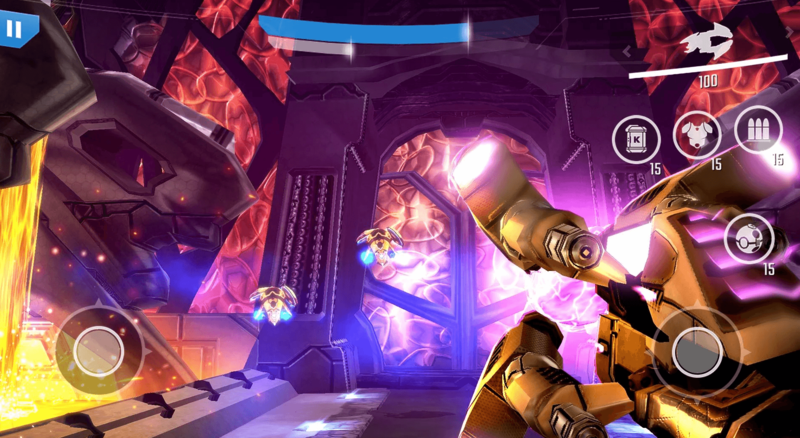 Take your robot to combat positions and take part in mass battles with the help of destructive weapons.